Introduction: While Natural Orifice Translumenal Endoscopic Surgery (NOTES) is very appealing from the patient’s perspective, it is surgically challenging by its very nature because access is limited to the size of the natural orifice. It is difficult to have multiple instruments simultaneously passing through an orifice, and the instruments must be flexible throughout their entirety to traverse the natural lumen. This study demonstrates the feasibility of using multiple miniature in vivo robots to improve spatial orientation and multitasking capabilities for NOTES procedures. Methods: The three miniature in vivo NOTES robots used in this study were a camera robot with panning and tilting capabilities, a lighting robot, and a tissue retraction robot. Each robot was designed to be completely inserted into the peritoneal cavity through a transgastric incision. Once inserted, each robot was held to the upper abdominal wall and positioned using magnets embedded in each robot and a corresponding exterior magnetic handle. Results: The cooperative robot concept was demonstrated in a non-survivable NOTES procedure in a porcine model. Using an endoscope, a gastrotomy was created and an overtube was advanced into the peritoneal cavity. Each robot was inserted into the peritoneal cavity and magnetically attached to the interior abdominal wall. Throughout the procedure, the robots were independently repositioned to optimize visual feedback, lighting, and task assistance. Visual feedback from the camera robot was used by the surgeon to explore the abdominal environment. 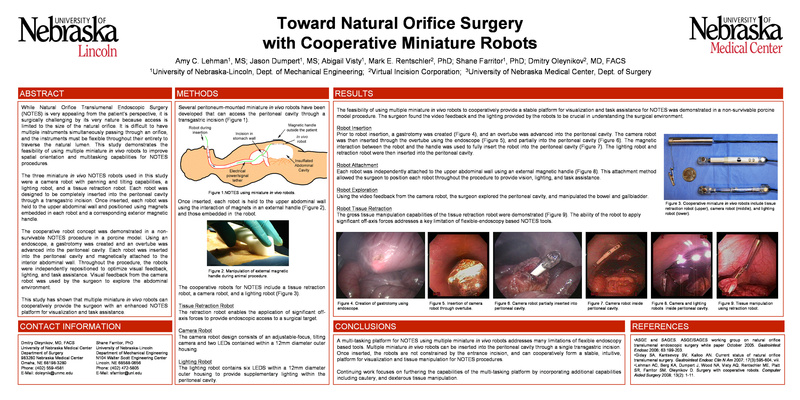 Conclusion: This study has shown that multiple miniature in vivo robots can cooperatively provide the surgeon with an enhanced NOTES platform for visualization and task assistance.